Chelsea boots those timeless boots that bring back memories of the sixties, the Beatles, or the Rolling Stones. 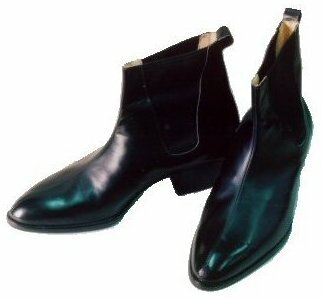 Chelsea boots quickly became popular with Mods because it fit in with their sleek, tailored look. Some varieties sported the so-called ‘Cuban heel,’ which was supposedly derived from flamenco footwear. Check out Ray Columbus and the Invaders on “She’s a Mod” not a great song but you get the essence of Mod style. Although the song grows on me and I’m very jealous of the thick heads of hair. And the more contemporary chiseled toe model designed by Michel Perry for J.M. Weston.